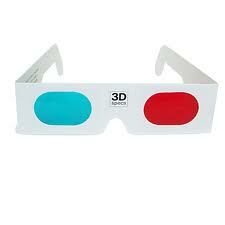 Now build your own 3d glasses at your home to enjoy 3D movies, games, photos in computer with very easy steps in short time. Cut out the sample pattern (including eyeholes) for your 3D glasses and tape the sides to the center section. You now have your stencil for the actual glasses. Trace the stencil on the oaktag or sturdy poster board. Cut the glasses out making sure to also cut out the eyeholes. Tape the red (left) and blue (right) acetate pieces to cover the eyeholes. Make sure to cut the acetate pieces a little larger than the opening for the eyes. DO NOT get tape on parts of the acetate visible through the eyehole.